April 2016 – During our stay with our friends in Montana’s Bitterroot Valley, not only did I get a chance to ride a horse across glorious pastures and fields, but we both got to experience a different way of life that is a very special. 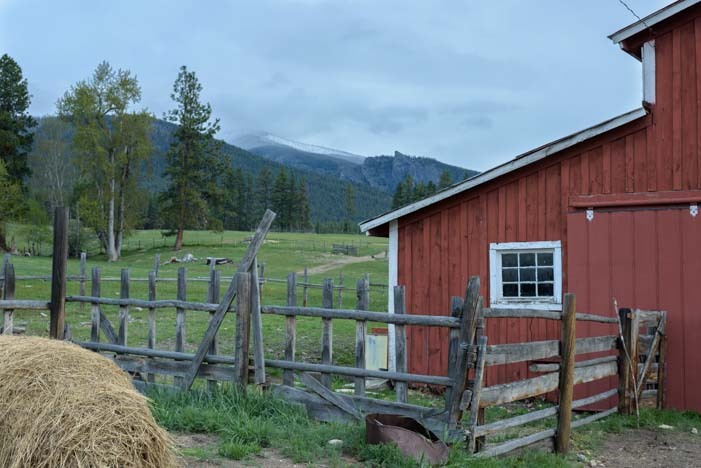 We learned a little about ranching and horses during our stay in Montana! 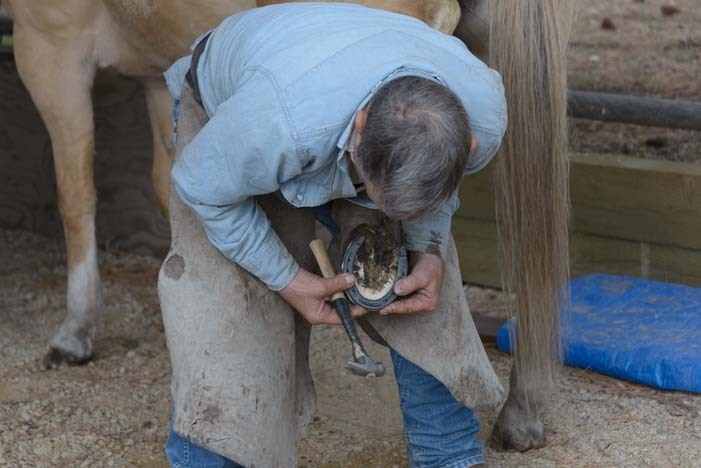 For starters, we got to see how horses put on their shoes. Snipper needed new shoes after he’d spent a winter running around barefoot in the snow, and his trusty shoe man, Jake, came around one morning to fit him with a new pair. 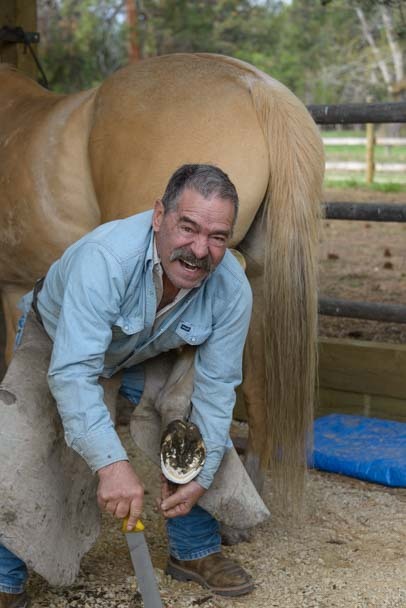 First, the hoof has to be cleaned and trimmed a bit. He worked quickly and easily, cracking jokes the whole time. 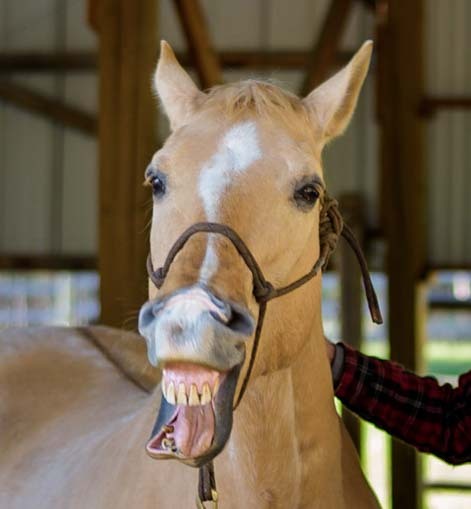 There are a lot of very funny things you can say when you’re working at the back end of a horse. Jake kept us all laughing as he went about his work. 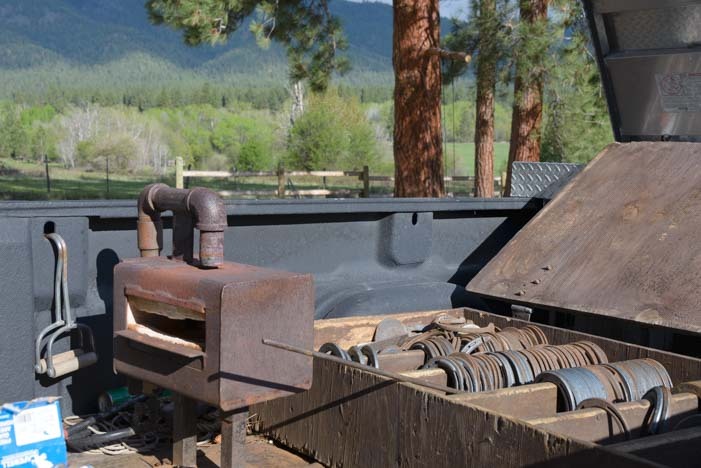 In the bed of his pickup, he had an array of different size shoes and all kinds of tools for the job. 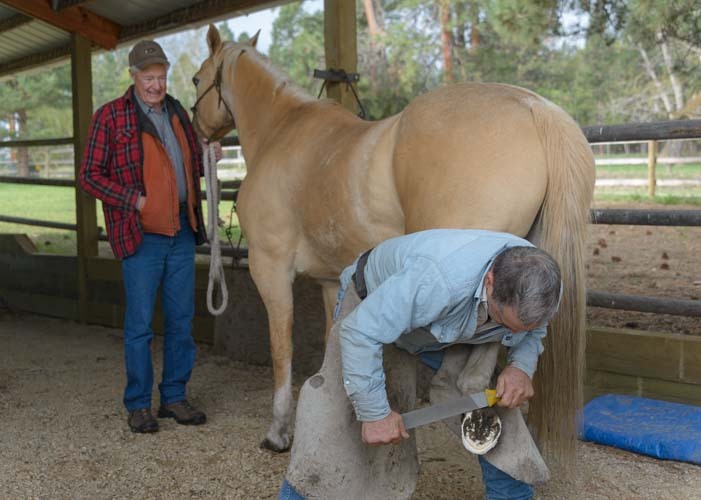 Tools of the trade for a horseshoer. 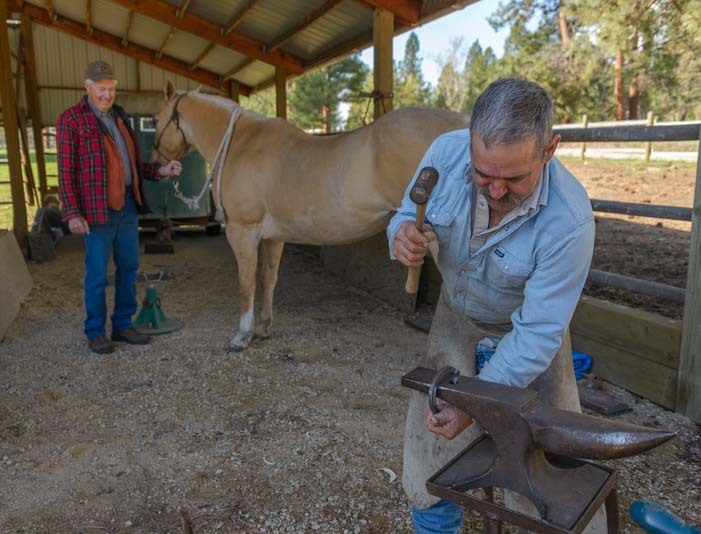 Watching him file down each hoof and hammer on a new shoe, we felt like we had been transported back in time to another era. Horse shoes come in all sizes. Suddenly, he suggested that Mark give it a try. He took off his chaps and gave them to Mark to put on. Then Mark lifted Snipper’s foot and tried to steady it between his knees. It’s not as easy as it looks!! Mark tries his hand at the job… not so easy!! And what did Snipper think of all this? Snipper thinks this is all rather funny! 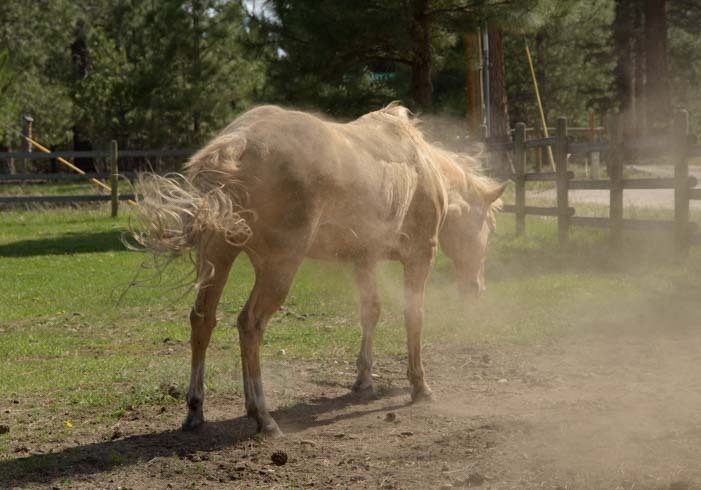 Of course, he’d rather roll around in the dirt and shake the dust off! New shoes are nice, but a roll in the dirt is even better!! 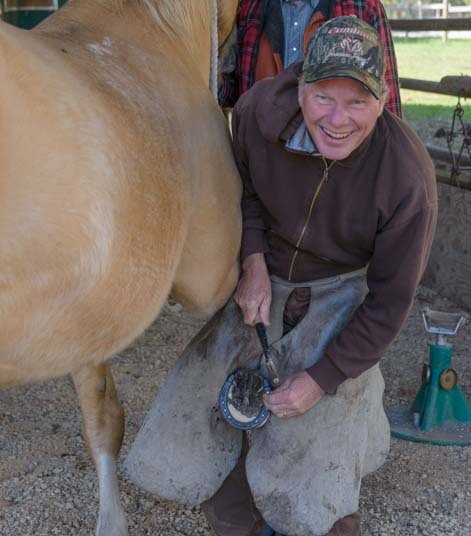 Riding a horse was a special event for me, but it is all in a day’s work at Carl’s cattle ranch down the road. He and his hired man Jack and sometimes our friend Bob routinely round up the cows on horseback to move them from one field to another or to gather them all together for inspection or treatment. 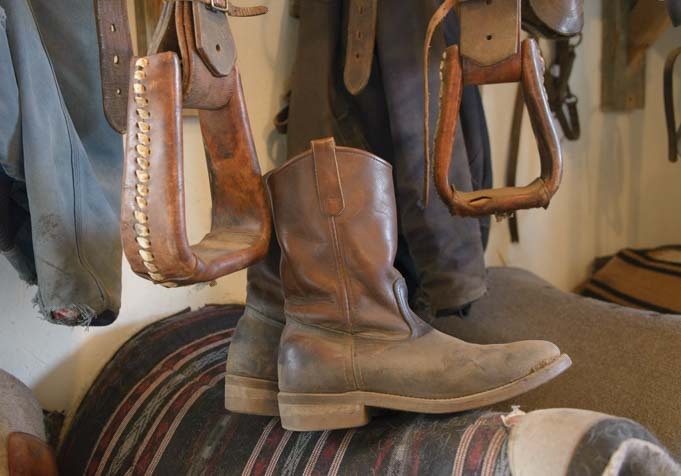 Stirrups and boots for cowboy work. 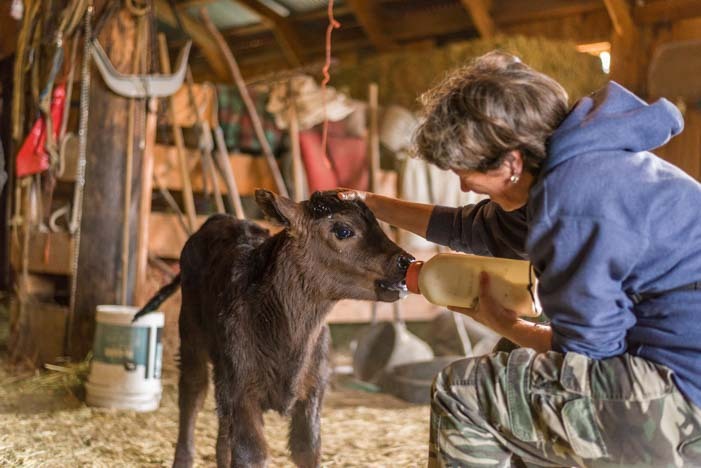 Every cow on Carl’s cattle ranch has a single job to do: deliver and raise a baby calf each year. 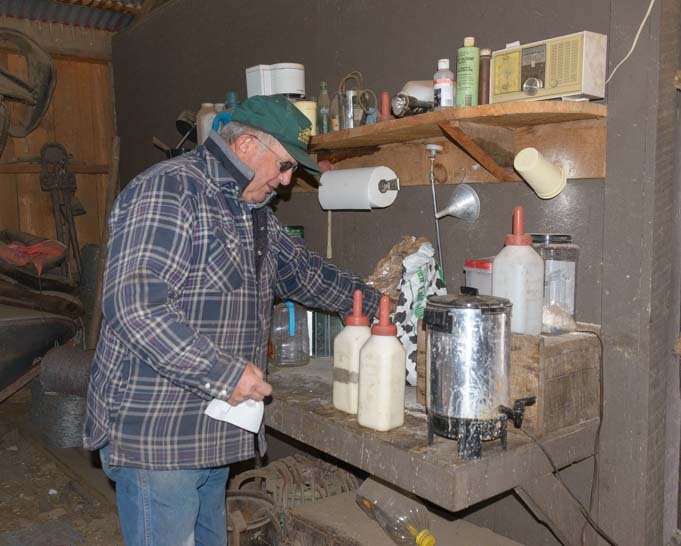 In the summertime, a (very lucky) bull is brought to the ranch, and his job is to get all the cows pregnant. The cows are already raising last year’s calves when this happens, and they keep them until October when the calves are sold and shipped off. This is a very sad day for everyone on the ranch, as the cows all mourn their loss and moo loud and long for a few days. But they are happily pregnant, and in March, the cows all give birth to their new calves, and the cycle starts again. We were fortunate to spend time on a cattle ranch where the cows are lovingly cared for. When you have a ranch, you’ve gotta have ranch dogs, and two of them liked to catch a ride on the four wheeler whenever it got driven around. 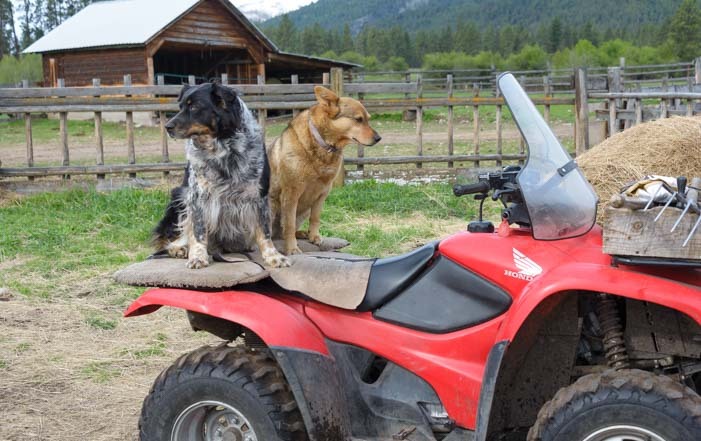 The canine ranch hands get a ride. But the alpha dog on this ranch is Taiga. 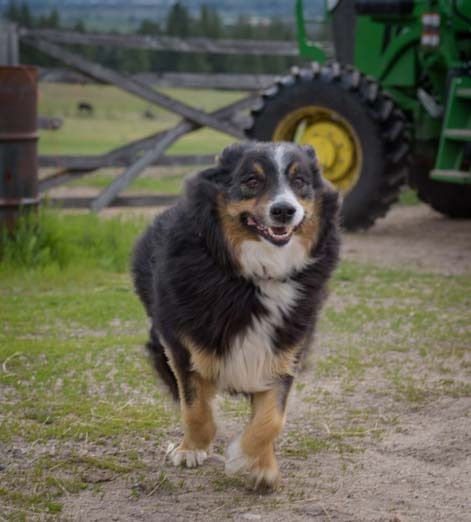 She is a beautiful Australian shepherd that we met as a young puppy seven years earlier when she had been on the ranch for just a week. She has grown into an incredibly loyal and obedient and responsible dog. Little pup Taiga is all grown up now. I was floored when Carl yelled out to her, “Go get that calf!” and she did exactly that! This ranch is loaded with momma cows and their baby calves, and Taiga has a strong mothering instinct too. She sometimes mothers the calves a little bit. Taiga gives the baby calf a little lick. Usually cows have just one calf each year, but this year two of Carl’s cows gave birth to twins. When cows live in small fields, they can keep track of their twins and raise them both. But on large grazing pastures like Carl’s ranch, the moms can lose track of two separate babies if they start wandering off in different directions and one disappears behind a hill or something. 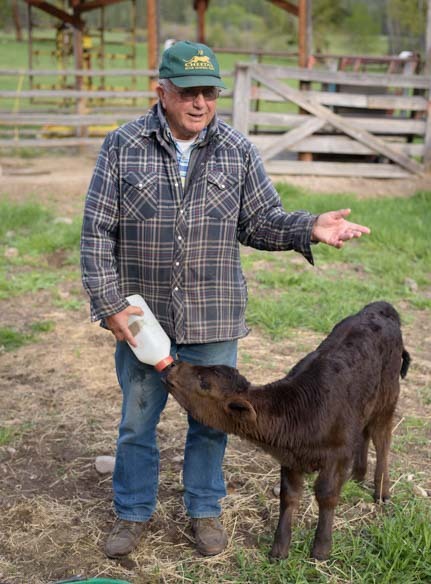 So Carl and Jack hand-reared two calves this spring, one twin from each mother cow, and they bottle fed each of them a special calf formula twice a day. The orphan calves are bottle fed a special formula that gets warmed up a bit. 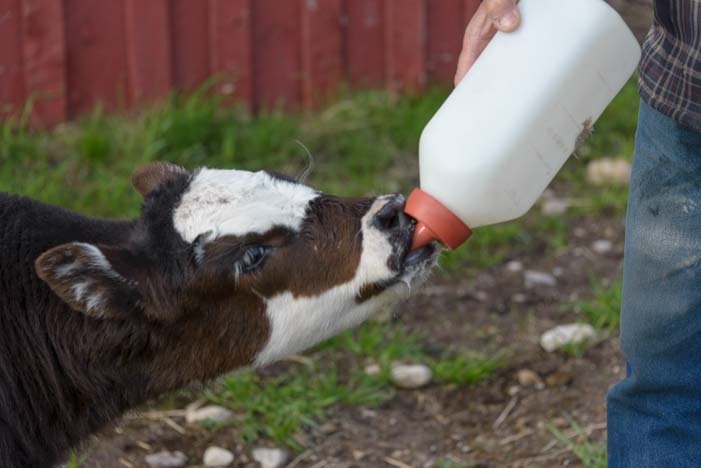 For Carl, bottle feeding a calf is a piece of cake, and he can do it one handed. Bottle feeding a calf is easy, right? He explained that sometimes an orphan calf can be given to a surrogate mom who just lost her calf for some reason. 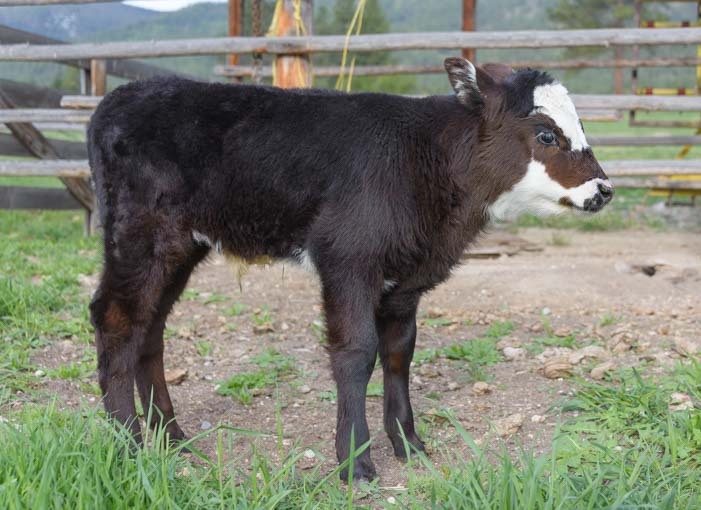 The easiest way to make the mom accept the baby is to tie the skin of her dead calf across the back of the new adoptee. The mother cow will recognize her calf’s smell and will readily accept the new baby and raise it as her own. But none of Carl’s cows lost their calves this year, so these little guys were orphans. One had a brown face and one had white patches on its face, and both were very hungry and eager to gulp down their milk. Carl asked if we’d like to try bottle feeding the baby calves, and we jumped at the chance. Just like the horse shoeing, though, it was a little more challenging than it looked. The calves were very cute, but towards the end they had milk all over their faces and we had to clean up a bit too!! These two little orphans needed special care and couldn’t go through the summer on the ranch without a mom to watch over them, so they needed new homes and went off to an auction while we were there. 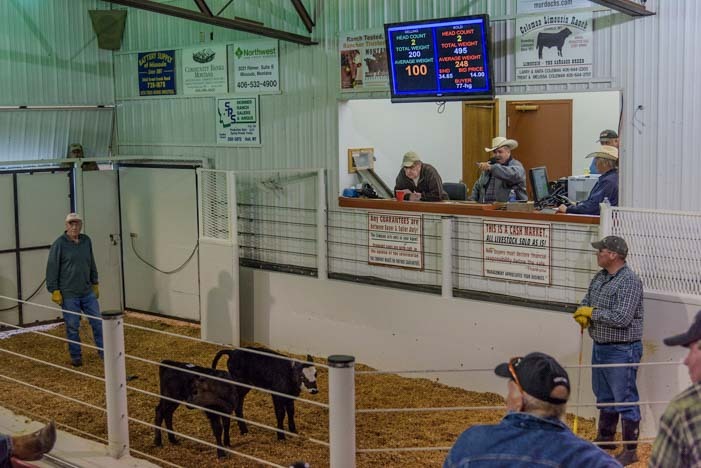 The little calves go to the Livestock Auction. We hooked up with them at the Livestock Auction in Missoula. We saw a few hogs get sold, and then a blind calf and his mother cow were sold, and then our two little bottle fed calves came up for sale. 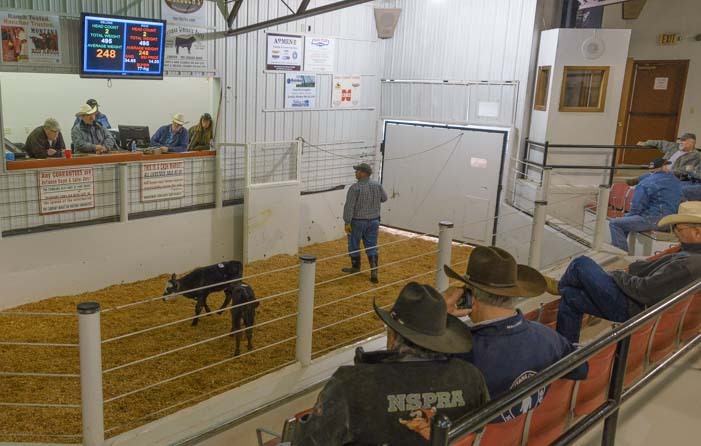 The auctioneer began his wildly fast patter and sang out the virtues of each calf and their weights and starting bids. He continued in a blast of unintelligible chatter until suddenly one was sold and ushered out of the pen. He resumed, and moments later the other was sold and scampered out of the pen too. 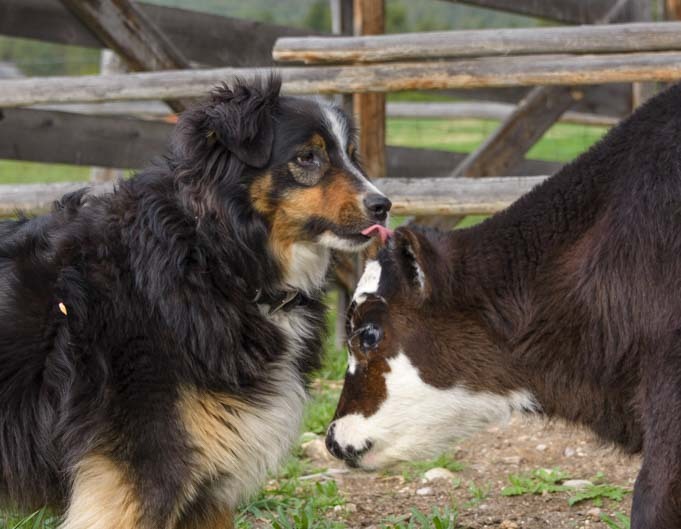 From horses to cows and calves, we loved our Montana ranch visit. More of our Latest Posts are in the MENU above. This entry was posted in Montana and tagged Cowboy Culture, Montana, Montana Bitterroot Valley, New, Travel, USA, WP Travel by Roads Less Traveled. Bookmark the permalink. 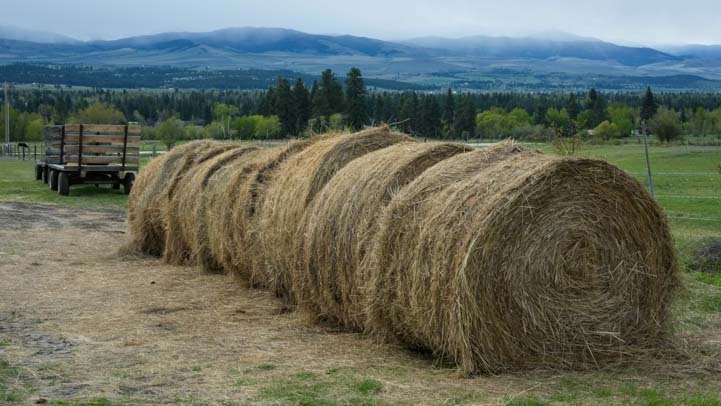 Very nice article regarding the Montana Cattle Ranch. This brought back memories from the summer of 2016, as Karen and I both worked as volunteers at the Grant/Kohrs Ranch in Deer Lodge, MT. This is a National Historic site administered by the National Park Service. We worked as volunteers giving interpretive tours of the original Ranch House, and worked in the visitors center. 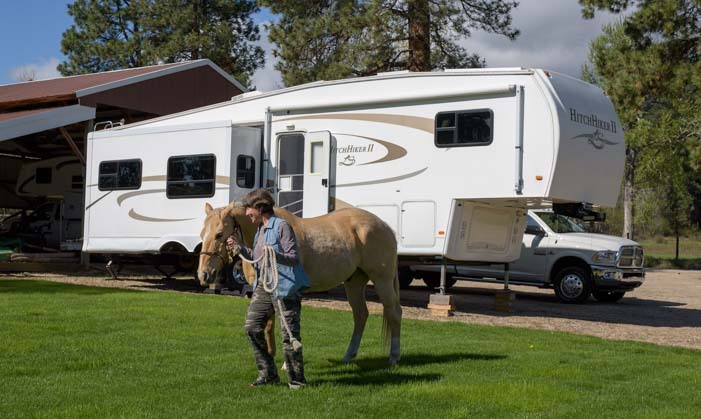 We were provided a space at the Deer Creek RV Park, which was next door to the ranch. I also used my photography skills to help update the photos on their website, and for other purposes. That sounds like a really great experience for you both. What a great workamping job! Have fun in San Luis and at the dentist!! The charge controller (left) and inverter (right) are at the heart of a solar power installation and give you the ability to park anywhere and still use all your favorite electrical appliances. To learn more, visit RV Solar Power Made Simple for more info. Shrink-wrap your screen door for winter! All you need is shrink wrap (left) and a hair dryer (right). 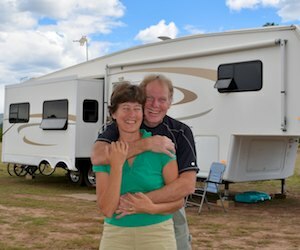 Learn more here: Winter RVing Tips. --Emily & Mark Fagan, traveling full-time by RV and sailboat since 2007. Welcome to our site...and enjoy! !